This morning I heard the very sad news that mountaineer Steve Perry has died while climbing with Andy Nisbet on Ben Hope, the most northerly of the Munros. Long-term readers of this blog will remember that Steve used to cop up quite often in these pages. Scotland was Steve’s first love and he will always be remembered as the man who completed the first continuous, winter, round of the Munros (raising over £3000 for Cancer Research along the way). Steve also embraced the TGO Challenge. He moved up to Scotland to be nearer his beloved hills. Steve was interviewed by the outdoors Station on a few occasions and you can hear him there talking about the famous winter walk and about life in general — an interview recorded at Kinbreak Bothy while on the TGO Challenge. It’s a reminder I guess of how dangerous mountains can be, but Steve loved those mountains! Since everyone has returned from the TGO challenge I’ve had a number of phone chats with Challengers who wanted to know all about the injury and event withdrawal. We talked quite a bit about floating around the Highlands and especially about longer stays in some of the places we usually just race through. A few folks have suggested that I write some of this up. So, here goes. To start with a recap. From Attadale we were given a lift by a local to the Loch Carron Hotel and we spent a couple go glorious days there in simply magnificent weather. Well, it is that time of the year again — the TGO Challenge time. The end of October sees the deadline for TGO Challenge entries and for many the next few months will be spent studying maps, past Challenge route journals, identifying camp sites and booking accommodation. My entry is in and I have too consider whether to simply use last year’s route (as we didn’t get to the event in the end) or to create a new one. Creating a new one might seem a bit of an unnecessary task, but route planing is great part of the whole experience. And yet, I approach route planning with nowhere near the excitement that I did years ago. This one photo — taken from the article — just sums up everything that feels wrong. And it is now pretty difficult to cross your favourite terrain without experiencing this on one or two occasions. A few years ago fellow blogger and TGO Challenger Alan Sloman was ranting about the same issue and declared that Scotland was Dead (or something like that). He is prone to this kind of dramatic statement but, of course, he was raising a very important point. If this continues that the Highlands will simply begin to loose its allure for many hill walkers. These kinds of development have blighted my last two Challenges. In 2015 Kate and I took the easy route into Glen Mazarin, walking the gentle lanes to approach the Glen rather than approaching from the main boundary ridge which is my favourite route. We passed the works entrance to the Dunmaglas wind farm. As we walked down gentle lanes on a gorgeous, sunny, morning we are constantly shaken by heavy good vehicles. As we took to the hills we climbed and viewed the access road to the construction site. It was a dramatic but ultimately depressing sight. The problem is not simply one of wind farms. Increasingly, estates are driving new tracks over land that for the estate owners has little utility value. For walkers the tracks not only blight their walk but create navigational hazards. The temptation to follow a new path when you find it — assuming you know where it is going — is great. I wish I had a £10 note for every time I’ve met someone who followed one of the tracks and then regretted it. In 2016I took the newish hill road from Fort Augustus to Glendoe. This road — it is really more than track — was built to facilitate the construction of the new Reservoir in Glendoe. The road is a mixed blessing. It does get you into the hills pretty quickly and allows you to cover a lot of ground. But it also gives you a horrible insight into how our hills might look in years to come. I’m not against wind power or hydro power, far from it. But the issue of sensitivity when planning is key. Some like seeing turbines gently rolling in the wind. Some don’t. But for me the turbines are the least of our problems. The access roads cut though the hills to build the farms will last forever. The concrete bases of the turbines will surely I’ve longer than the turbines themselves. These concrete foundations will stand as a latter day henge. In centuries to come will visitors stand and wonder at the these strange standing objects? A horrible insight into the future is gained at the top of the Glendoe climb. Here a large works site had been cut. The temporary buildings on the site have now gone but the concrete foundation to the site remains, like to some oddly abandoned supermarket car park. As you walk on you pass by many remnants of the construction work. Over time the reservoir itself will fill and grow. But there is no obligation to return the ground to its original condition. It doesn’t have to be like this. The estate at Loch Ossian was constructing (last timeI was there) a series of new, small, hydro sites. Display boards explained to us the benefits of the project but also critically assured us that the landscape would be restored when construction had finished. This estate. of course, makes much of its income through tourism. They want their hills to continue look nice! So, route planning is not quite the exciting experience it was. Now I am studying maps to try and avoid these scars. All of my Challenge crossings have started from Northerly start points; I had been laving the Southern ones until I got older. But many my revised route might look to do something completely different this year and maybe the highest hills might even avoided. If the hills themselves are loosing some of their charm then the TGO Challenge event itself has much more to offer, the comradeship of walkers and the privilege and waking through an ever-changing landscape. But I’m not almost of the view that my best trips to the Highlands will be shorter trips simply because they can be planned to avoid these scars. So, follow campaigners like Cameron and Chris Townsend and follow organisations such as Parkwatch. As a society it is time we became more facilitated. Yes, we can support renewable energy but we can insist that this commitment is not inconsistent with ensuring the landscape is both protected and returned to pre-development conditions whenever possible. Scottish Track Surfaces — Is it Just Me? An exchange with @trickygreen (in the comments section) has raised an issue that I have thought about writing about. Actually, the issue is a feature of my TGO Challenge Journal (which is now almost finished). @trickygreen raises he wearing of trail shoes on the West Highland Way. 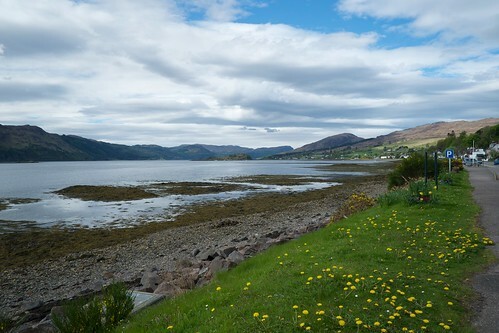 Now, I have not walked the West Highland Way but I have done sections of it. I really dislike walking on this surface mainly because (own the sections I know) they are strewn with rather too large stones which are unpleasant and some times uncomfortable to walk on. On this TGO Challenge I set out to create a route that minimised tarmac walking. I walked along a number of tracks that I have walked in the past. On more than a couple of times i found myself looking forward to a stretch of a walk only to find the track surface to be quite unpleasant. I suppose a lot of these tracks have been improved or ’maintained’ to be better able to take heavy weight vehicles. Is this just my imagination or route planning? While I’m on the subject of feet, I’ve had a number of emails about the achilles/Plantar Fasciitis issue. There will be a bit of a focus on this in my TGO Journal (which is nearly finished) but …. … the change inches back to the Inov-8’s has made a big difference. The Plantar pain has completely disappeared and I’ve been walking pain free all summer. Looking back, it seems that the the built up sole unit of the Brooks Cascardias were a bit of a disaster for me. On the Challenge the only really difficult day I had was the long road walk from Braemar to Ballater, where the achilles began to complain rather loudly. I shan’t be doing this stretch again (at least not for a while). The 295’s have done well although I noticed last week that the sole on my left foot has collapsed inwards. I’m still hill walking with these shoes but my impressions that I won’t get as much life out of them as I did with the Terrocs. Those with more sensibly arranged feet might not have this kind of problem, but it is something to consider! Sometimes you just have to pay homage to the great inventions! This chip shop is in Stonehaven. It hit the news recently as it was feared they would not be able to advertise themselves as the home of the deep fried Mars Bar. 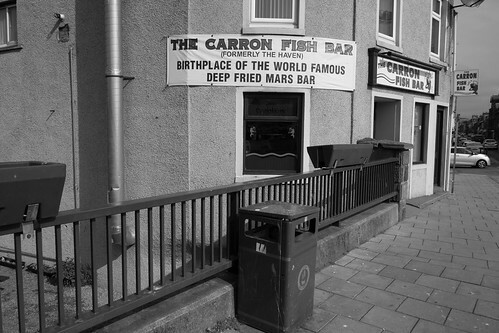 I snapped this early in the morning after a fun Scottish Breakfast and thankfully the chippie was closed! I was introduced to these delicacies by a Glaswegian nutrionist about 20 years ago. She convinced me that the deep fried Twix bar was superior and we went out and tracked one down (they will usually deep fried anything). It was surprisingly nice! Now, this will no doubt appeal to many walkers. This bench has a built in table. The first genuinely useful innovation I have come across for a long time!